If you have any questions about the PAN ORAMA information page below please contact us. The large superyacht PAN ORAMA is a sailing yacht. This 53 metre (174 foot) luxury yacht was built at Perama Shipyards in 1993. Superyacht PAN ORAMA is a striking yacht that is able to sleep a total of 48 guests on board and has a total of 16 crew members. This balanced superyacht has been brought about by naval architects Pan Yachting. 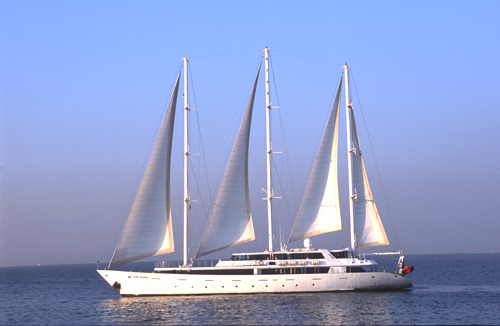 Panorama is a three-masted sailing yacht with steel hull built in Greece in 1993 and was partially rebuilt in 2001. The yacht has nine cabins with double beds, ten cabins with twin beds, four cabins convertible from twins to double, and two cabins with three beds. All cabins have en suite private facilities, TV, Video, mini bar and direct dial telephone. The yacht's wider design collaboration came from Pan Yachting. The formal naval architecture intellectual property are a products of Pan Yachting. Greece is the country that Perama Shipyards constructed their new build sailing yacht in. After her formal launch in 1993 in Perama she was delivered on to the happy owner having completed sea trials and testing. A fairly large area is manifested with a maximum beam (width) of 12 m or 39.4 ft. With a 4.82m (15.8ft) draught (maximum depth) she is fairly deep. The material steel was used in the building of the hull of the sailing yacht. Her superstructure above deck is fashioned with the use of steel. In 2001 extra refitting and modernisation was in addition finished. The vessel utilises two efficient CATERPILLAR main engine(s) and can accelerate to a industrious speed at 15 knots. The engine of the ship generates 720 horse power (or 530 kilowatts). Her total HP is 1440 HP and her total Kilowatts are 1060. Her propulsion units are twin screw propellers. The boat’s efficient cruising speed is 13 knots which gives a range of 2000. Providing cabins for a limit of 48 yacht guests spending the night, the PAN ORAMA accommodates everyone in style. Under normal conditions she carries approximately 16 expert crew members to maintain and sail. Man 2 times 185 kilowatts, Perkins 1 times 45 kilowatts. PAN ORAMA features a teak deck. The luxury yacht PAN ORAMA displayed on this page is merely informational and she is not necessarily available for yacht charter or for sale, nor is she represented or marketed in anyway by CharterWorld. This web page and the superyacht information contained herein is not contractual. All yacht specifications and informations are displayed in good faith but CharterWorld does not warrant or assume any legal liability or responsibility for the current accuracy, completeness, validity, or usefulness of any superyacht information and/or images displayed. All boat information is subject to change without prior notice and may not be current.